038. VOYAGES TO THE SOUTH POLE. Issued by Oxo Limited (1934). Card number 23 from a set of 24 entitled "Feats of Endurance". Size: Ca. 1.4" x 2.15". 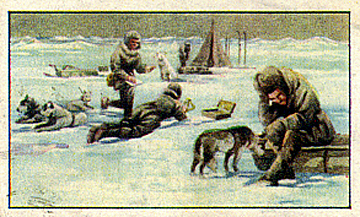 Recto: View of men, dogs, sledges, skiis, tent on the ice. Verso: FEATS of ENDURANCE | SERIES | 24 SUBJECTS | No. 23.--Voyage to the South Pole | Capt. Robt. Scott sailed in the "Terra Nova" in January, 1910, for the South Pole, which was reached two years later. On the return journey the party lost their way, failed to reach the food cache situated only 11 miles distant, and every member succumbed to starvation and exposure. The diary of Capt. Scott, subsequently found, contains a record of bravery and fortitude probably unequalled in the world's history. | "OXO" is also sold in Bottles :-- | 1 oz. 7d. 4 oz. 1s. 11d. | 2 oz. 1s. 1d. 8 oz. 3s. 6d. 16 oz. 5s. 6d. | Don't get run down--take OXO | Issued only with Oxo Cubes | "OXO" | LIMITED | THAMES HOUSE, LONDON E.C.